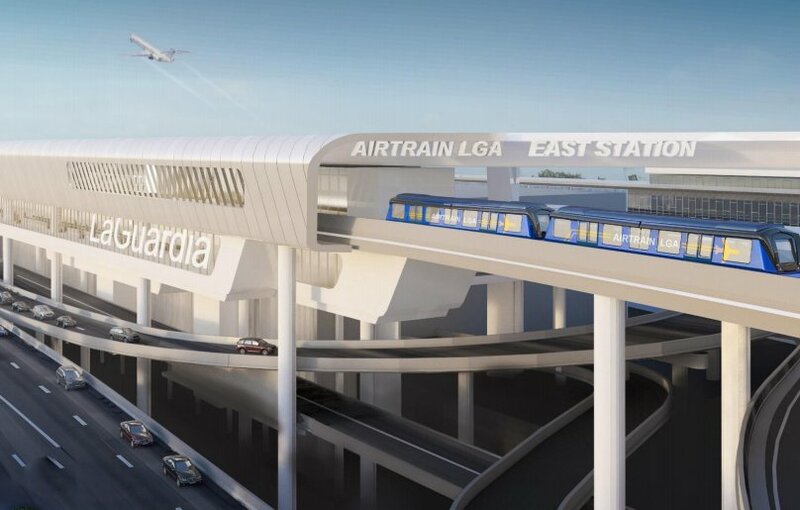 AirTrain LGA would connect with public transportation at Willets Point, relieving airport congestion. Willets Point Station will be modernized, made accessible to people with disabilities, and designed for travelers with luggage, providing a seamless transition. Passengers traveling from Manhattan could reach Willets Point in 16 minutes on the Long Island Railroad, with direct, non-stop service from Penn Station–and Grand Central Station pending the completion of the East Side Access project. From Willets Point, it’s just six minutes to the airport. The coalition’s announcement coincides with a Wall Street Journal article that warns of roads between Midtown Manhattan and LaGuardia Airport becoming so congested in the coming decades that by 2045 it may take up to two hours to make the trip. A rail link to the airport might move between 8.4 million and 12 million people annually by then. The Port Authority is looking for consultants to undertake an environmental review of the $1.5 billion train project, and has said it is still in early planning stages for the train and all other possible options. The review process is expected to take from 12 to 18 months. Executive director of the Port Authority Rick Cotton, said, “There’s no such thing as an average trip anymore,” citing Port Authority studies that say the average travel times are getting longer while the number of days with delays that top 70 minutes is growing. Earlier this year, Gov. Cuomo signed a bill that allows the state to take public land along the preferred rail link route for the proposed train.